Waiting in a doctor's office can be stressful. Have you ever wondered how to relieve stress when in a doctor's office waiting for your appointment? If you have, you are one of the many thousands of people that find themselves becoming stressed and anxious as they wait their turn to see the doctor. While most everyone experiences some degree of nervousness when it comes to seeing their doctor, for many people the time spent waiting for their appointment is a very stressful situation. The longer they wait, the more anxious they become. As they become more stressed and anxiety builds, the waiting time seems longer and the time seems to pass slower causing them to become even more stressed. If you have experienced these feelings while waiting for an appointment at your medical practitioner's office, in most cases there are activities and techniques that you can do to reduce or prevent stress from occurring. For many people understanding the reason they experience stress while waiting to see their doctor is the first step toward reducing the stress they feel. Not everyone experiences stress while at their doctor's office for the same reasons. For many patients, the stress is related to finding out the results of previous tests, worry concerning a possible illness, or concerns of a possible painful procedure during the appointment. Others may be stressed by the amount of time that goes by while waiting for their turn. With busy schedules themselves, they perceive the time spent waiting as lost time and as they think of all the other things in their busy schedule, stress builds. This stress is partly caused by the fast paced world of today. It is a time of instant messages, emails and fast computers. People are used to things being done instantaneously. 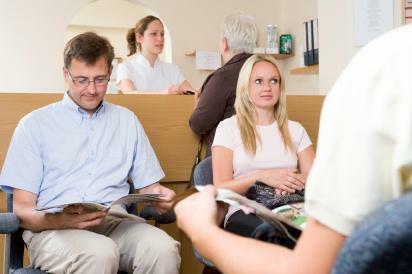 When it comes to a doctor's appointment, generally there is always a waiting time. A few of the people that experience stress waiting for their appointment suffer from iatrophobia, or fear of doctors, particularly if they do not visit the doctor frequently or if they are seeing a new doctor. There are many activities and stress management techniques you can do in a doctor's waiting room to reduce or eliminate stress completely. Use the time sitting in the waiting room to do something you enjoy. Often people bring a book with them to help the time passed quickly. If you enjoy crossword puzzles, word searches, or sudoku puzzles, take them along with you. Keeping your mind busy and focused on an enjoyable activity is an excellent way to keep stress in check. If you enjoy music bring your MP3 or iPod and listen to music that is calm and relaxing. If you have a cell phone, use it to play games or send text messages. Always check to make sure that cell phones are permitted in the waiting area. Knit, crochet, or draw if that is something you enjoy doing. If you have a busy schedule, consider bringing some work along with you to stay productive while you wait. As you feel the first signs of stress beginning as you wait to see your doctor take a slow deep breath. Deep breathing is a natural stress reliever and an excellent stress management technique that is easy to do anywhere. Take a few slow deep breaths and you will feel your body relax and the feelings of stress subside. The following is a simple deep breathing technique that provides quick relief from stress. Inhale slowly and deeply through your nose to the count of six. Hold that breath to the count of two. Exhale slowly and completely through your mouth to the count of eight. Another excellent stress management technique to use while waiting in a doctor's office is visualization. Also known as guided imagery, visualization uses your imagination to relax and calm your mind and body. Imagine your favorite peaceful calm place. Let yourself feel as if you are really there - seeing the beauty, smelling the aromas, and hearing the sounds. Visualization slows down mind chatter, helps you relax, and releases built up stress and tension. Knowing how to relieve stress when in a doctor's office, no matter what the reason for the visit, will make those necessary appointments more enjoyable.